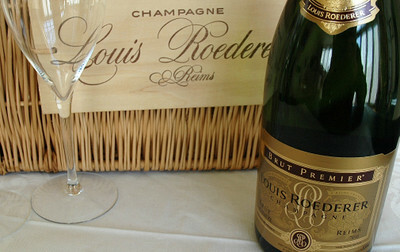 Today I'm drinking this bottle of Roederer champagne with our friends John and Margery from British Columbia who have are holidaying in Australia. This is an unusual lemon I discovered on a recent visit to the Hot Houses in Auckland Domain. I also met a grower at the Auckland Food Show that has grown them on his orchard north of Auckland. 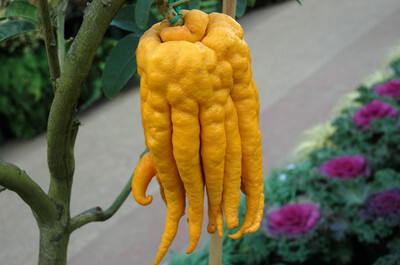 It is called a Buddha's Hand. They are grown for their powerful zest. Visit the San Francisco Foodie for her recipe of candied peel. I'm soooo over this winter weather we are having in Auckland. Two weeks in sunny Queensland is just what the doctor ordered. The suitcases are packed and we are off on Wednesday. We will spend a few days in Brisbane , a night with friends at Tambourine Mountain then up to Noosa to relax by the beach and finally a few days with friends on the Gold Coast . I'm looking forward to meeting up with The Old Foodie in Brisbane where I'm sure we will discuss blogging. We have tickets to see Hugh Jackman in The Boy From Oz . Hugh portrays the life of Peter Allen , the Australian singer once married to Liza Minnelli. I'm planning on dining at Montrachet in Brisbane , Berardos and Humid while in Noosa and wherever our friends suggest on the Gold Coast. By the magic of Typepad a few posts will pop up for you to read while I'm away. I'll see you in September. 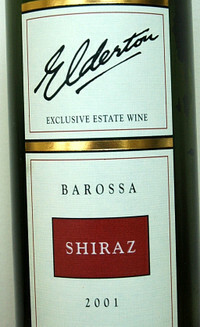 After 8 months without a glass of wine last Saturday night I opened this bottle Elderton Barossa Shiraz 2001 . I can tell you it was worth the wait. The colour was intense, I swirled the wine around the glass releasing some nice aromas of chocolate, vanilla, plum, a faint touch of liquorice and finally the taste was a good balance between oak and fruit. I'm packing a bottle to share with friends in Brisbane on Wednesday. Lis and Ivonne are having a party and everyone is invited. They are such busy little bloggers they've asked us all to bring some food to share. In New Zealand this is called a Pot Luck dinner or Bring a Plate. 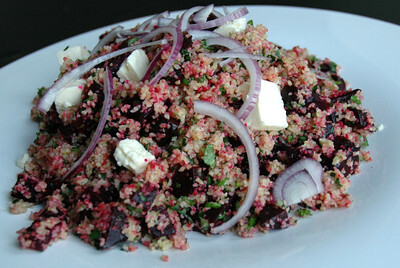 I'm taking this Beetroot Tabouli. The Laughing Gastronome posted this idea on her blog last week . I tried it out on the family who pronounced it a huge success. You'll love it too. Visit Emma's blog to see her version. The amounts will depend on much salad you wish to make. In the above platter I used a cup of bulgar wheat and four beetroot. For each 1/4 cup bulgar wheat add 1/4 cup boiling water. Rest for 10 minutes. Wrap beetroot in foil and roast for 1 hour at 160C. Cool, peel and cut into cubes. Add oil, lemon juice, chopped herbs and salt and pepper to soaked bulgar wheat. I wrote this post a couple of days ago ready to enter into Ivonne's La Festa al Fresco before I went on holiday. When I was ready to post this I checked Emma's blog and under the comments discovered Bea had made and posted the same salad. Before I made the Beetroot Tabouli I emailed Emma to ask if she minded if I took her creation to Ivonne's party. She very kindly said she didn't mind. I hope Bea doesn't mind also. It is a sad day in the wine industry today with the death of Len Evans. My condolences to his family and all who knew him. Here are two of the recipes Donna demonstrated when I saw her at the Auckland Food Show . She calls this the cheats Soufflé as it is quick and easy and does not require a Béchamel sauce. Preheat oven to 200C (390F). 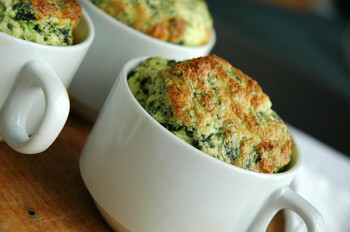 Place spinach,ricotta,egg yolk, Parmesan, salt, pepper, and cream in a bowl and mix well to combine. Whisk the egg whites until soft peaks form. Fold through the spinach mixture. Brush 2 x 1 cup (8 fl oz)capacity straight sided oven proof dishes with butter. Spoon the soufflé mixture into the dishes until 3/4 full. Place on a baking tray and cook 20 minutes or until soufflés are golden and puffed. I used coffee cups and the mixture made three. These little chocolate desserts are unbelievably good - chewy on the outside and soft on the inside. Preheat oven to 150C (300F). 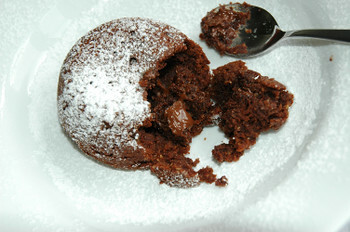 Place flour, sugar, almond meal, egg whites, butter, and chocolate in a bowl and mix well to combine. Spoon half the mixture into 4 x 1/2cup (4 fl oz) capacity lightly greased oven proof dishes. Place the chocolate squares on top of the mixture and top with the remaining mixture. bake for 20 minutes or until cooked but gooey in the middle. Stand in dish for 5 minutes before turning out. 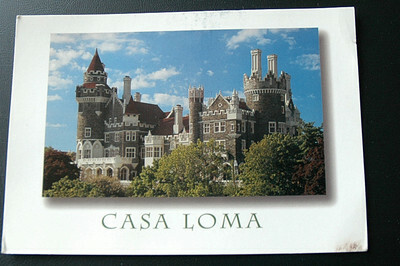 This is the lovely postcard I received from Julia in Toronto. It took me a little backtracking to find Julia's blog as she hadn't put the URL on the card. But find it I did and now you too can drop by and say hi to Julia at fictionally. I'm keeping this postcard in a safe place because one day when Julia's novel is published I'll bring it out to show my friends and say "This is the postcard I received from the famous author Julia Mazal". 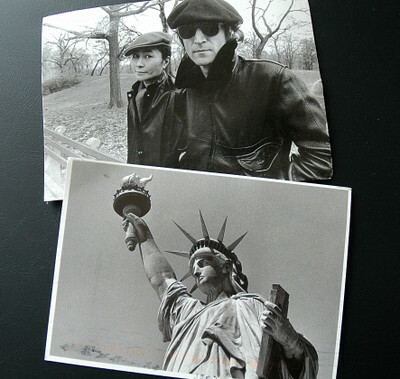 Thank you to Meeta for organising this postcard exchange. Bloggers are so kind. When I admired the card Chef Paz was sending from New York she offered to send me a copy too....but they were all gone so she sent me these two instead. It has recently been debated on how acceptable it is for bloggers to receive free copies of books in the hope they will read and review it favourably. I personally do not have a problem with it if an honest review is written. I'm quite sure all food and wine bloggers I read would give an honest review - good or bad. 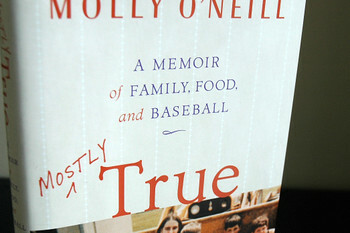 So when the publisher of Molly O'Neill's book Mostly True offered me a free copy I said yes. Books tend to be ridiculously expensive in New Zealand and it takes a while for many books to reach here. I was being offered a book that was unlikely to be available here. I knew who Molly was as I have a copy of her New York Cookbook . Forty Eight percent of my readers are from the United States so it seemed appropriate to accept the offer. For me the book was a little heavy on the baseball and I would have preferred more of her experiences as a chef and food writer. Baseball is not a popular sport in New Zealand or Australia, however I'm sure Americans who grew up with baseball will enjoy reading about the O'Neill family's dedication to the game. It seems growing up in the fifties and sixties in America was much like growing up in Australia at that time. Molly portrays the period well and her words brought back fond memories of my own childhood and teenage years. I mostly enjoyed the chapters on Molly's life as a chef and food writer. It never ceases to amaze me how hard chefs work. It is not a career for the fainthearted. Mostly True is a light hearted read, a book to pick up and put down as the mood takes. A book to be enjoyed by men or women. This was my find at the Food Show held in Auckland last weekend. It is a lemon Liqueur made in a similar style to the Italian Limoncello. 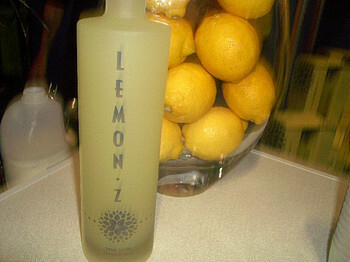 Visit the web site of Lemon-z for the story on this New Zealand made limoncello. It has more lemons and less alcohol and the taste is smooooth. I personally was a little disappointed with this years food show. Far too much processed foods. It seemed every second booth was either pesto or dukka. The Donna Hay and Geoff Scott demonstrations were both on at the same time on Thursday and I had to see Donna and miss Geoff. With Geoff's demo titled "Geoff Scott Goes Outside The Box With Vanilla" I was sorry to miss him. I would love to know how he uses vanilla in seafood and savoury dishes. For the first time Fromage Du Nord were exhibiting. I went back for more than one sample of their washed rind cheese and I'm told it will soon be available in the supermarkets. It is possibly the only washed rind cheese in New Zealand now Puhoi Valley have stopped making one. Another find were these Lico Olives imported from Puglia into New Zealand by Delmaine and available at the deli counter of your supermarket. They are very large with a buttery taste. 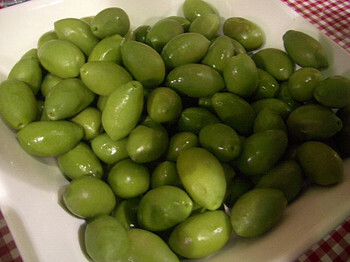 I can't find any information for Lico on Google but it sounds as if if these Cerignola olives may be the same thing. Especially for those people living in Auckland I sampled the best apple juice in the world. It is not available in the shops but contact La Ronde Orchard (phone:094128150) for delivery to the workplace. And finally for lovers of Blue Swimmer Crabs I tasted samples from Phillips Foods who are importing the crab meat from South East Asia into New Zealand. Their representative assures me the crabs are not farmed with large doses of antibiotics as some imported Asian prawns are. Here is a recipe for Macha cookies sent to me by Mikako , the sister of my friend Ryoko , who lived with us for 12 weeks last year. Mikako says not to eat too many at one sitting as Macha is high in caffeine. Place butter and shortening in bowl and whisk until white. 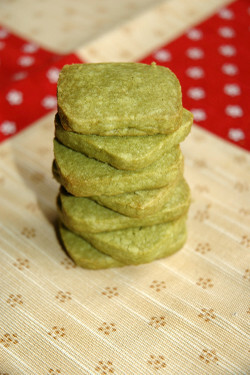 Sift flour, almond powder, and Macha tea powder into same bowl and stir with a wooden spoon. If it is too dry add a little milk. Shape into triangle (or square or cylinder), wrap in plastic wrap and place in freezer for 1 hour. Preheat oven to 180 (350) degrees. Remove plastic wrap and slice cookie dough. Place cookies on parchment lined baking trays. Bake for 12 - 15 minutes. Yes that is Donna Hay hiding behind me. She has just had a baby and any woman who has ever "just had a baby" will understand why. I'll never forget hopping on the scales the day after my first son was born and despite having just delivered a healthy 8 pound 10 ounce baby I hadn't lost an ounce. 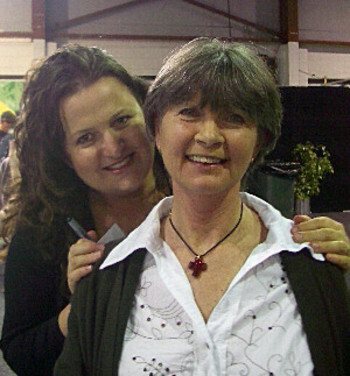 Donna is the special celebrity guest chef at this weeks Auckland Food Show . Everyone really enjoyed her presentation. She was professional, well prepared, funny and very relaxed. Her relaxed manner was a joy. I have been to other cooking demonstrations where the chef is not comfortable in front of the camera and it can make the whole event tiresome. Following the demo Donna was very busy signing books but we managed a brief chat about the Hay Hay Its Donna Day. She seemed quite pleased with the interest our blog event has created for the magazine . I had made arrangements to meet up with Celine at the show and while I grabbed us a couple of good seats Celine went off to find coffee. Donna presented a three course dinner of Spinach and Ricotta Soufflé, Roast Garlic Baked Chicken, Salsa Verde Potatoes and Molten Chocolate Cakes. Donna's secret is all her recipes are quick and easy, making them ideal for our busy lifestyles. Next week I will recreate the recipes and post them. The individual soufflés are so easy. 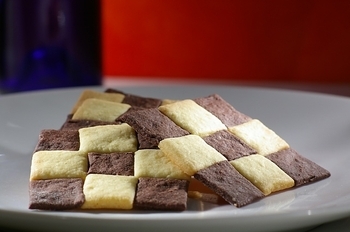 With the help of Bron here is a mini roundup of Hay Hay It's Donna Day #3 - The Checkerboard Snap Cookies. Together we knew of 9 entries and we are very sorry if we have missed anyone out. If this is the case please leave us a comment sharing your entry, we'd love to see it! This article in the latest Springwise newsletter caught my eye. The creator of this non profit, social cause is looking to take the concept to disadvantaged areas in America. There are probably many disadvantaged areas of the world where this concept would work. Something to think about don't you agree? I'm participating in the postcard event organised by Meeta from Whats For Lunch Honey . Here is the postcard which has gone to a blogger somewhere in the world. Already this event has had me searching the maps and googling Google for this town, which I had not heard of before. This has been a fun event to learn a little more about another blogger and where they live.